"front and rear cameras" - sounds like an automotive product. in the cross section image the barriers between the cells are clearly visible when viewed at full scale. surprisingly the lower ends have higher contrast and look quite white there. the color filters on the bottom end can be distinguished by their thickness and their variation of gray. why do the micro-lens appear misaligned with the pixels? To limit the light fall-off towards the edges of the sensor (what I call sensor "vignetting"). 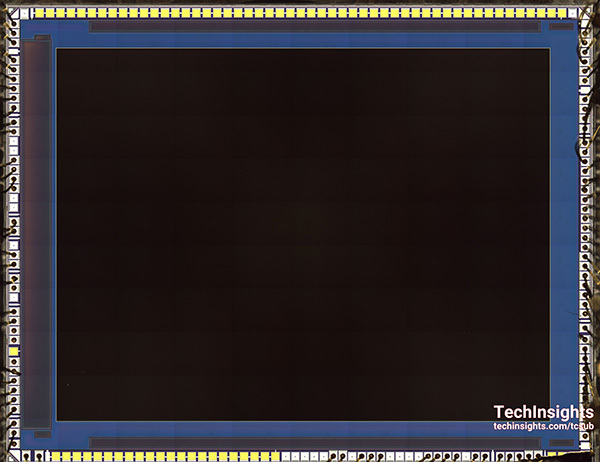 Without the misalignent, the micro-lenses would focus the light next to the photodiode, at least for the pixels at the edge of the sensor surface. the micro lens grid on the center of the imager is perfectly aligned whilst going to the outside of the sensor plane the micro lenses tend towards the center. imagine the rays of light coming from the classic lens system is (for the center rays) a pyramid or cone shape. thus any additional lens with a significant offset to some other structure needs to take into account the slope of the ray to make the optimum match. the "aperture grid metal" sees a little shift as well. probably incoming rays for this cross section area are meant to originate from a source on the very bottom right (outside the area of the cross section picture). at least that's my thesis for reasoning what can be observed.